Today I released new social widget for WordPress. 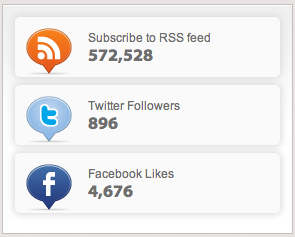 This widget will display your RSS subscribers, Twitter followers and Facebook fans in one nice looking box. Take a look at the screenshot bellow. Move (drag and drop) the widget to your desired location in the active sidebar. Enter Full Facebook URL, Twitter ID and Full Feedburner URL and save changes. You have to enter just your twitter ID instead of full URL this time. I have the latest update of your plugin. What if you only have two of the three? I don’t use FB. Can I just show RSS and Twitter? I installed and enabled the Social Counter Widget plugin, and put “IAMSpirituality” in the Facebook URL tab, which is my fanpage URL, and the widget is showing 0 likes (when there are actually 1252). Am I doing something wrong? Is there a way to use it in multiple widgets, but only one at a time? Such as if there is a widgetized footer with three widget areas, use one for Facebook, one for Twitter, then the other for RSS? The Facebook counter does not work, no matter what URL I use. HTTP or HTTPS, full URL, info URL, nothing. Everything else works, but I can’t get your plugin to work with Facebook. My URL works with other Facebook plugins though. Ok, thank you, I’ll try to discover whats wrong. I have the same problem with Ethan. Full page facebook url does not work. It always shows 0 followers. Is there a way I can remove the feedburner code from the social-counter-widget.php and add Google +1 instead? I’m with @Moebis. Can you replace one of them with Google Plus instead? Also having the same trouble with Facebook counter on the widget, it is not showing any likes when the page does have some. Full URL does not work? Thanks. Updated version is available on wordpress.org. I fixed the issue and it should work now. Same issue… downloaded and installed from WP. Looks great BTW… RSS works…Twitter works… Facebook does not. The link works and takes you to the page.. but the number of likes does not register. All works now. Thanks. Keep up the good work. No go… RSS and Facebook doesn’t show? Well up until last week everything was working with the last update, but now my twitter counters is back to saying 0, it used to display the correct number. Yes I do have just the twitter name in the box, not the full url. (again it was working exactly as is up until very recently). Can you suggest some other fixes? Rss dont count on my wesite. Thank you, Csaba Kissi, for updating the plugin. You fixed the problem of facebook. But RSS is broken. The number of RSS subscribers is always 0. Could you fix it? Same problem here RSS is broken. Does your plugin support template shortcode as I wish to display it else where. I downloaded the most recent version of social counter widget, and input my full Facebook URL, but the count still says “0” How do I fix this? I activated this plugin but it shows me 0 for google feed URL. What is wrong? I’m also having an issue with the RSS feed always showing 0. I’ve double checked and put the correct full url in but no joy. when I added the widget, it caused fatal errors. im getting these errors when i insert a feedburner url. if i delete the feedburner-part the rest works just fine. fopen should be able to use. du you have any ideas how to fix it? is it possible to have a tumblr follows? I’m also having no luck with getting the RSS feed subscriber number to appear. I think there is not working anymore. Are there any working alternatives? Hello!! Very cool plugin.. thanks!! BTW, I do posted “twitteraccount” not the link! Is it possible to add a SoundCloud button here? my themes dont widgett support ? how to add counter code sidebar ? Thks for this widget. How can i translate “twitter followers” or “facebook likes” in french ? I Really love this plugin but it keeps on turning the “0” Followers for both Facebook and Twitter, Is there any solution for this? Just wanted to let you know what the Twitter followers sometimes shows the correct count, but most of the time it displays “0”. Any recommendations? I’ve deactivated the plugin and removed my Twitter handle from the SCW options. I entered my twitter and facebook ids but the fb one doesn’t work. (i entered the ID not the name, i mean 596316637045143) Any solutions? Waitin’ for answers asap. So I installed this plugin yesterday, and it worked great right off the bat, very happy with it. Until this morning… twitter is now down to 0. How do I fix this, I am using the ID like I am supposed to. twitter change the api from 1.0 to 1.1….. at this time Social Counter Widget won`t work. any update ???? I installed that plugin .And when I write the all correct information and release my page, there is nothing shown.The problem is I dont see anything about your plugin in main page. (Yes I added the plugin to my rightside) And when I delete rss link it shown but twitter follower 0.. Please can you help me from mail?